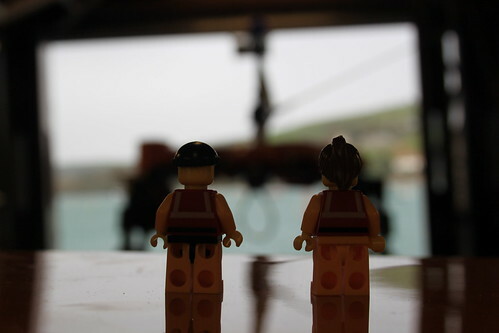 This week brings the final instalment of the little guys’ visit to Salcombe. 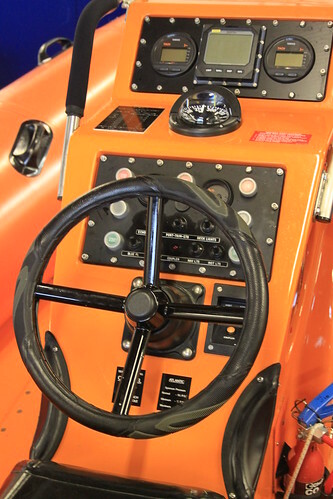 You’ll recall from the first and second instalments that our guide, crew member and volunteer press officer Matt, has already shown us around the lifeboat centre and museum, as well as around the station’s impressive Tamar class all-weather lifeboat (ALB). 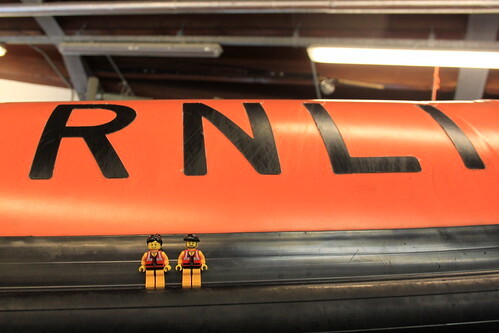 So our next stop is the boathouse and the inshore lifeboat (ILB) that it houses. As we entered the building, the first thing we noticed was a huge great box by the door. It looked like some kind of space-age washing machine, festooned with big (and rather tempting) buttons. This, Matt explained, is the paging system. When the Coastguard decides that the lifeboat is needed, or if the station itself decides that the lifeboat needs to launch, the Lifeboat Operations Manager (the ‘Honorary Secretary, or ‘Hon. Sec.’, in my Dad’s day) or one of the Deputy Launching Authorities (DLA) pages the crew using this gizmo, which sends a suitable message (by radio) to the crew’s own pagers. The paging system can also be operated by phone. 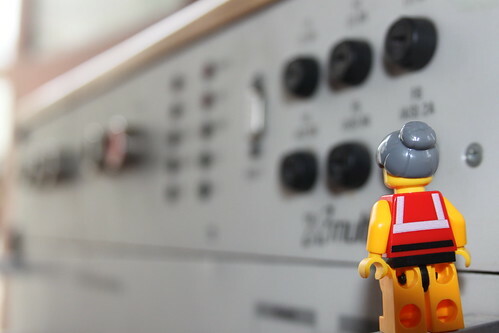 When the crew members receive a page, which says something like ‘Launch ALB’*, ‘Launch ILB’ or ‘Launch both lifeboats’, they get to the station as quickly as they can and then get ready to go. As most of the crew live or work (or both!) quite close to the station, we’re looking at a matter of minutes here. Things happen fast, Matt was keen to emphasise. Very fast. Older readers may remember that maroons were sometimes used to summon the crew at some stations, either as a back-up to pagers or instead of them. Essentially massive fireworks that emitted an enormous ‘bang’, these had the potential to behave a little erratically, so they’ve been phased out now. But they did serve the useful purpose of letting everyone, not just the crew, know that the lifeboat was launching. This brought communities together, but perhaps more importantly also warned anyone near the lifeboat station to get out of the way. 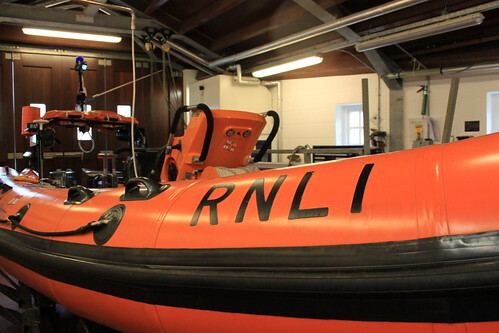 The station is currently exploring the use of a siren to fulfil a similar function, alerting the community that the lifeboat is launching and encouraging pedestrians and watercraft to clear the area around the slipway or launching area. Matt was enthusiastic about this, though was amused that the station would have to play a warning announcement before the siren went off. Presumably something along the lines of ‘Attention. A big siren is about to go off. Then lots of people are going to come charging at you from all directions. Then the lifeboat’s going to launch. Please get out of the way.’ Personally, I prefer the maroons (I’m a bit of a traditionalist about such things), but the siren really does sound like an excellent idea. 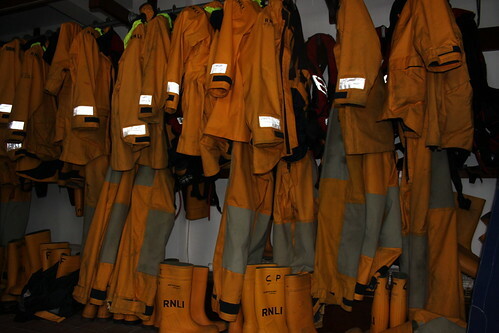 To avoid wasting time when launching the lifeboat, the Crew’s kit is all hanging up and ready to go in the boathouse. 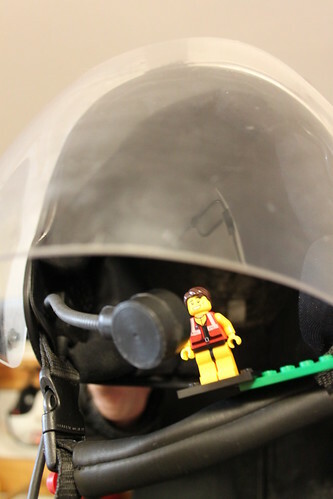 This includes oilskins (OK, so it’s Goretex now, but I guess we can still call them oilskins) for the ALB crew, drysuits for the ILB crew, protective equipment for the shore crew and lifejackets for everyone. 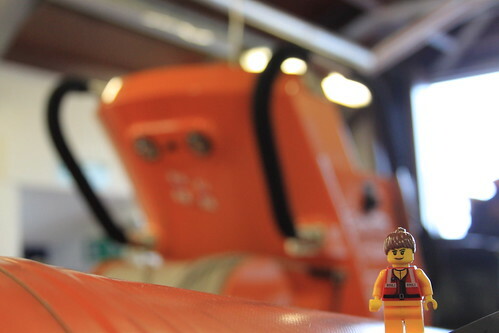 In the main boathouse, the station’s Atlantic 75 inshore lifeboat ‘Joan Bate’ was ready for service. Technically, she’s a B class lifeboat. There are two types of B class lifeboat – the Atlantic 75 and the Atlantic 85, which are roughly 7.5 and 8.5 metres long respectively. The name Atlantic comes from Atlantic College in Wales, where the class was first developed. With a crew of three, fuel capacity of 182 litres, two 75 horsepower outboard engines and a top speed of 32 knots, the Atlantic 75 has an endurance of two and a half hours and can carry an astonishing twenty survivors. The helmsperson steers the boat from a central console, which attracted crew member (and ace helmsperson) Susie like a moth to a flame. As you can see in the photo below, the helmsperson has full control of the boat from his or her seat. The other crew members sit on seats just behind the helmsperson. These crew members control the navigation and communications equipment. 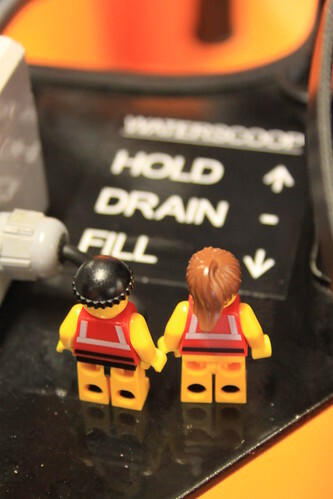 The Crew were keen to check out the lifeboat’s controls. They were particularly impressed with the ‘waterscoop’, which scoops in water underneath the bow to add ballast to the forward end of the boat when working in heavy seas. As our tour came to an end, the Crew felt privileged to have had the opportunity to learn so much about the station and its boats. And so did I. I remember my Dad working on the development of the Atlantic 75 when I was younger, so being able to see the boat up close brought back fond memories. In fact, my Mum has somewhere in her house a big framed photo of my Dad on one of the early Atlantic 75s, together with one of the Atlantic 21s that it was designed to replace, signed by all of the crew that had helped to prepare her for service. Looking at his grinning face in the photo, you’ve never seen anyone so happy. 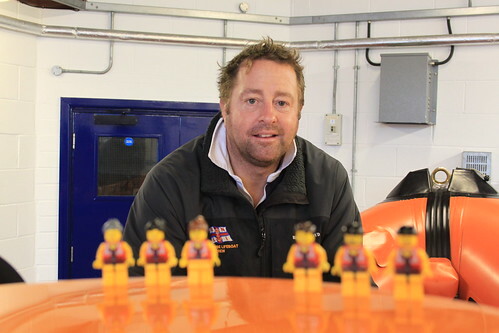 All that remained was to thank Matt, who had given up a large part of his weekend to welcome us to the station and to share his enthusiasm for the work of the lifeboats and their brave crews. So a massive thank you, Matt, for being such a great host. It was an absolute pleasure to meet you and to learn so much about the station, its boats and its crew. 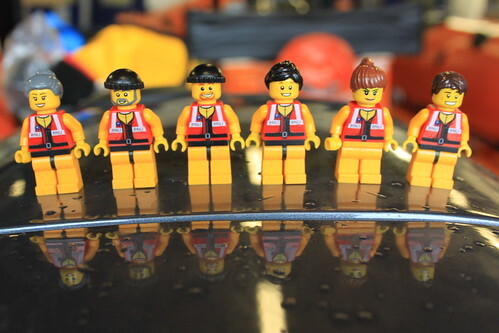 This entry was posted in Out and about and tagged Lifeboats, RNLI, Salcombe, The Lifeboat Crew by Simon Perks. Bookmark the permalink. The little guys & girls really did have a grand day out & enjoyed themselves. It made very interesting & enjoyable reading. Keep it up. Thanks, Maggie. I’m glad you enjoyed reading about the Crew’s escapades.